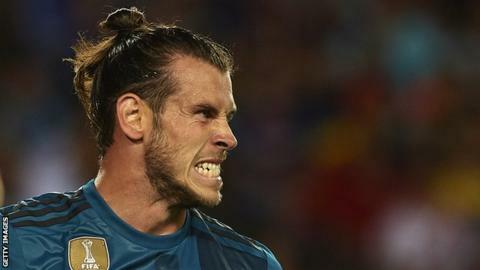 Gareth Bale will not be affected by recent criticism from some Real Madrid's fans, according to Wales manager Chris Coleman. Bale is with Wales preparing for their 2018 World Cup qualifier against Austria on Saturday and the 5 September trip to Moldova that follows. Last Sunday, Bale was jeered by some home fans while his club drew 2-2 with Valencia at the Bernabeu. "This latest episode won't faze him at all," said Coleman. "People wondered how he would handle it when he went to Real Madrid (in 2013) because you are like a film star there, but he absolutely cruised through it. "He's answered all the critics. He's matured in the last four or five years and come through it with flying colours." Spanish forward Marco Asensio scored both Real goals against Valencia and is pushing for a place in the team ahead of Bale when the suspended Cristiano Ronaldo returns to Real's line-up. Coleman expects Bale to handle the situation with maturity. "There's been a couple of periods where he has been under a lot of pressure, but all he needs to do is put his medals up," Coleman said. "Yes, he's had one or two injuries but he's won three Champions Leagues. "No one else has ever gone to a foreign club from this country and done that. Absolutely nobody can doubt him," said Coleman. "He's always a story, he's one of the best players in the world. Things will be said and that's the way it is. However, Coleman believes even his star player was not worth the then-world record £86m Real Madrid paid for him in 2013. That mark was more than doubled when Paris St Germain signed Neymar from Barcelona this summer. Coleman was asked if Bale would now be worth more than the fee for Neymar. "Is anybody worth £86m to start with? Or is anybody worth a hundred million more?," replied Coleman. "It's bonkers. It's absolutely crazy. In my opinion, there is not a player on the planet who is worth that much money. "There's not. But football has gone to that level. It's not the player's fault. "If clubs are willing to pay that much money for players then you can't blame the players for that. "But I can't agree that any player is worth that much money."